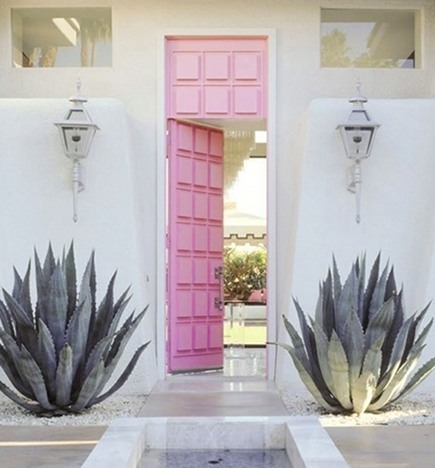 Unexpected color on a pink front door puts a modern spin on the entry of a desert home. Bubble gum, Barbie Pink, Pink Panther or Pepto-Bismol. No matter which name the color brings to mind, the owner of this Palm Springs mid-century style home went for a feminine statement. The contemporary door style, with 3 over 9 raised panels — was personalized with an eccentric paint color and elaborate hardware selections. In desert communities, white stucco is common on home exteriors. I’d love to see the coach style lanterns replaced with modern fixtures – simple, large sconces with clear glass globes. The pair of blue agave plants add texture and interest to the entry, along with the water feature that is slightly visible in the foreground. Someone who loves glam clearly lives here. The elaborate silver finish handle is jewelry for the door and slightly Mediterranean in contrast to the ’50s California style. But overall, the mix blends into a harmonious, and unforgettable, whole. For more entry ideas, see Grand Entrance Doors. 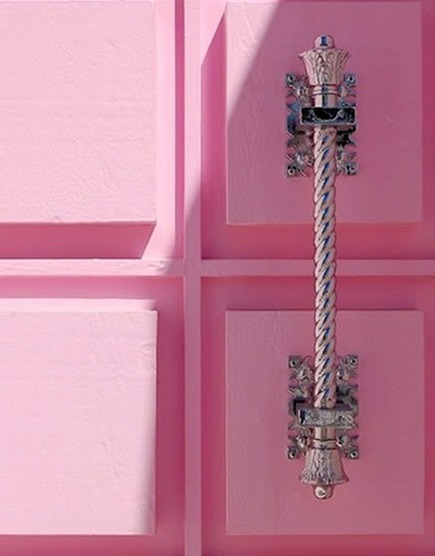 Anyone else think the door handle looks like a scepter?